MeltFlipper® Design Services - Beaumont Technologies, Inc.
MeltFlipper® Design Services provide a custom solution for each unique application. 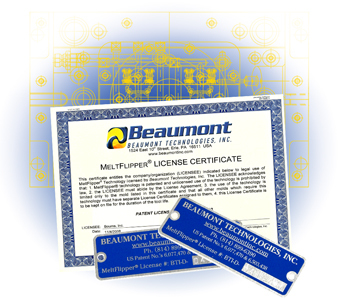 With a custom MeltFlipper® design service, Beaumont will evaluate your current mold design. Based on our evaluation, we will design a custom MeltFlipper runner system tailored specifically to best fit your tool – and your product. Our design services are compatible with new and existing tools, and are the most popular method companies choose when implementing MeltFlipper. 1. 3d CAD file showing your custom MeltFlipper runner design. The file can be imported directly into your mold’s CAD file, and then the MeltFlipper runner can be machined into your runner plates. 3. MeltFlipper License Certificate (pictured above). This certificate is for your records and confirms the referenced design is properly licensed. Every MeltFlipper design service comes with a 100% satisfaction guarantee. If MeltFlipper does not perform as expected for any given mold, we will refund your service cost 100%. Contact us to learn more or receive a quote!